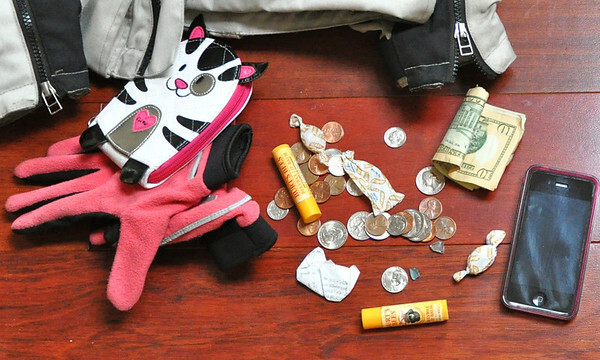 What’s In Your Motorcycle Gear Pockets? Some people are tidy and organized in a way that I could never be. My motorcycle tankbag was always filled with scraps of paper, loose goldfish crackers, old receipts and junk that wasn’t necessary – on top of things I needed. Now that I have the Tiger with sidebags and am tankbag-less for now, my side cases do the bulk of the work duty. One sidebag has things like rain gear, maps, highlighters, paper and a marker, my Slime pump and a Tire plugger kit. The other sidebag carries daily odds and ends like my work shoes and lunch. What’s in my gear pockets? My pockets are full of joy and and lolly pops. Thanks for playing along Fuzzy. I like the kitty wallet. Way cool. That is the wallet isn’t it? Somehow it seems so you. That seems like the right balance of stuff. Not too much stuff. My mundane jacket pockets just have a pair of earplugs, and my key. I’m confused. I don’t see any anti-Giant Chicken Apocalypse gear in the mix. I worry for you. Now that my bike has a top case I’m able to bring my purse. Love that for riding to work cause my laptop fits in it too. I agree with Trob, the wallet is very you. I’m boring. My pockets contain earplugs. Period. 😆 Thanks, Kathy. It used to have a little fishbone zipper pull on it that bit the dust. Yes, please share what’s in your luggage before you go. Stuff just has a way of accumulating, doesn’t it? Check Out Our Fabulous Motorcycle Road Trip T-Shirts!